Samsung had a smartphone breakthrough last year with the Galaxy S III, which sold 50 million units worldwide. This year's followup, the Galaxy S4, doesn't feel quite as eventful, but its hardware improvements and user-interface refinements are enough to preserve its status as one of the best Android smartphones. The Galaxy S4's design is virtually unchanged from the Galaxy S III. And when I say virtually unchanged, I mean that you have to be pretty obsessive to notice the differences. Aside from a slightly more rectangular body and a more substantial, metal-esque band wrapping around the sides, there's little to separate Samsung's successor from its predecessor. The most notable improvements to the phone's hardware guts come in its processor, display and camera. None are revolutionary, but they all match or one-up the Android status quo. The 5-inch, Super AMOLED display is one of the best Samsung has ever put on a phone, with a 1080p display and a pixel density of 441 per inch -- more than enough to eliminate any trace of pixelation. The screen could stand to be a bit brighter, but that's a minor quibble. Even with a bigger screen and a beefier battery, the Galaxy S4 managed to get ever-so-slightly thinner, slimmer, and lighter than the Galaxy S III. It also got a power boost. Still, the fact that the Galaxy S4 is more than three times faster than the Galaxy S III when run through the same benchmarking tests is nothing to scoff at. In using the phone regularly for a week, I rarely came across a moment when it suffered from significant stuttering, lag or overheating. The one noticeable exception was when I played "Real Racing 3," a graphically intense game that got choppy when too many cars were onscreen. That's not really Samsung's fault -- Android is notorious for its game lag. The Galaxy S4's camera is also improved, though we're at the point of diminishing returns. On paper, the leap from 8 megapixels to 13 megapixels sounds substantial, but we learned years ago that the megapixel arms race is only part of the story when it comes to camera quality. The Galaxy S4's best new photo trick is a camera sensor that's back-illuminated, which means it can capture more light and produce brighter, more-detailed images without the use of a flash. The camera works well in most normal situations. Its new user interface, pulled from Samsung's point-and-shoot Galaxy Camera, is nicely laid out and easy to use. The image processing time between hitting the shutter button and having a saved photo isn't blazing, but also isn't a nuisance. A few of the software advances, like being able to erase unwanted objects from an image's background or create time-lapse action shots, are neat and well-implemented. Of course, these improvements -- especially to the camera and screen -- require more power, and Samsung obliged by packing in a bigger battery. With the screen's brightness ranging between 50% and 75%, 4G turned on, and a few apps and services running in the background (Facebook, Gmail, Google Talk, etc. -- the usual suspects), I was still able to get through a full day with moderate use. With heavier usage, I found myself having to recharge after 6 to 8 hours. On the whole, I didn't notice any huge leap in battery life over the S3, but it certainly wasn't worse, either. The features Samsung wants buyers to focus on, though, aren't the Galaxy S4's internal guts, which are more or less identical to other top smartphones right now. 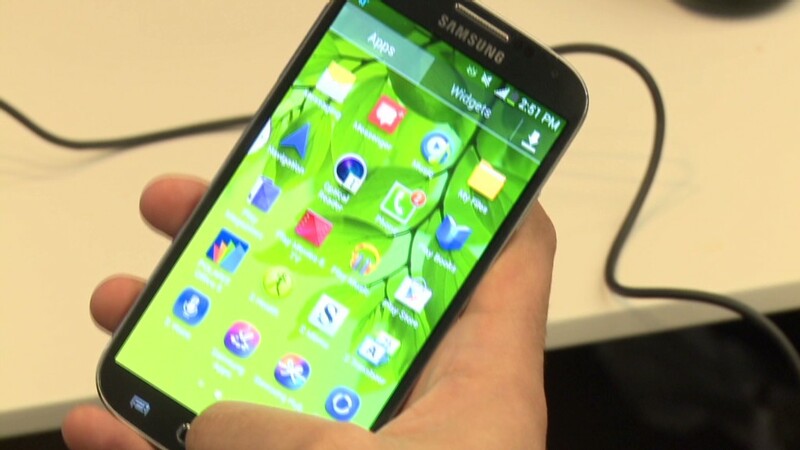 It's the software upgrades baked into Samsung's custom "TouchWiz" interface. The phone's flashier tricks include pausing video when you look away from the screen, letting you answer the phone by waving in front of it, and activating tilt-based scrolling when eye contact is detected. Samsung also pinched a few features from its Galaxy Note 8.0 tablet, like allowing two apps to simultaneously run side-by-side, and the Airview feature, which detects when your finger is hovering over -- but not quite touching -- the screen. The gesture can activate a secondary action or menu. Those are neat tricks, but they're more like a sword-juggling circus act than the revolutionary breakthrough Samsung would like them to be. They're interesting, novel and sometimes impressive, but they're not significant or lasting advances. None are meaningfully better than our existing methods of smartphone interaction. So, is the Samsung Galaxy S4 one of the best Android phones available? Yes. There are few other phones, period, that are as powerful and capable. But, in line with what we've seen from the past few iPhone generations, the improvements here aren't as pronounced and exciting as in past years. This isn't a phone that's going to convert an iPhone user, and current Galaxy S III owners aren't going to miss out on a whole lot as far as features go. If you're ready for an upgrade, and are in the market for an Android phone, there's no reason why this shouldn't be one of top two or three phones you consider. It's not the standout, though, that Samsung needs to remain the preeminent leader of the Android field. Hear that, HTC?